The Hot Air Solder Leveling (HASL) process has been the preferred coating procedure of the Printed Circuit Board (PCB) Industry for the past 20 years. Even with new regulations eliminating lead from solder, the HASL process has not lost its popularity or feasibility and still remains the preferred coating of PCB manufactures worldwide. Nihon Superior Co., Ltd. ( Osaka , Japan ) has developed the patented SN100CL Sn-Ni-Cu HASL alloy. This alloy has been specially designed as an alternative to Sn-Pb alloy and provides a high quality surface finish for use in the HASL process. 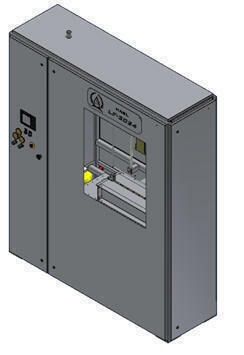 In addition, ACS Technologies, manufacturer of HASL Systems has completed the necessary modifications to their Model LF-3024 in order to comply with the process parameters required by Lead-Free alloys. A new designed Solder Pot and Solder Pump has also been designed specifically to handle Lead-Free Solder. The increased size of the Solder Pot extends the pot-life by reducing the frequency of copper extraction from the Solder Pot. Solder Pot exchange is very expensive and time consuming. The new designed Solder Pump has been greatly increased in size for better Solder Pot circulation. The stainless steel material of the Pump Shaft has also been upgraded to deal with material breakdown. There is no need to double cycle every PCBs. The Solder Pot now has a Stand-By Mode Feature which reduces dross build-up in the Solder Pot Weir while PCBs are not being leveled. If the system has not been cycled for 30 seconds the Solder Pot Motor will reduce to minimal speed, slowing down the Solder Pot circulation. ACS has specially designed their Hot Air Reservoir Heating System (HARHS) to provides a steady flow of pressurized heated air to the Air Knives. The ACS HARHS System provides over 2000 cubic inches of hot pressurized air! ACS and Lantronic HASL Systems are successfully running the new Sn-Ni-Cu HASL Lead-Free alloy. PLus, ACS is working closely with the HASL alloy Nihon Superior SN100CL lead-free alloy, in an attempt to provide direction, support, and service to the PCB industry. Our expertise and experience with the Lead-Free alloy provides a smooth and trouble-free transition when converting over to the new Lead-Free Sn-Ni-Cu HASL alloy. As we move ahead into the next generation of HASL finishes, be confident in knowing that the transition is brief and undisruptive. Your current pre-clean and fluxing applications need no modifications. ACS is available to assist you with this procedure. Time is of the essence, and procrastinating can lead to playing catch up or even lose of business to your competition. It is also possible that you will need to make modifications in other processes due to the higher processing temperatures, so now is the time to get all the bugs worked out. ACS can be reached at (479) 846-2403 or visit our web-site at www.acs-tech.com.